West Florida Genealogical Society – Tell my story. Before I contacted the Pensacola Historical Society to find out more about Emmett Wilson, I made copious pots of coffee and immediately dissected the three articles sent to me from Peg Vignolo of the West Florida Genealogical Society. Newspaper articles are rich with information — it’s not only the details IN the piece itself, but it’s the context to pay attention to when you read the articles: that is, what is said (subtly), what is not said (subtly), how the article is positioned in the paper, the language used about deceased, and so forth. The Pensacola Journal, May 29, 1918, page one. Courtesy of the West Florida Genealogical Society. Note the cause of death. Nothing in the obituary text gave a clue to his death — the writing didn’t focus on the cause of death, but seemed (to me) to deflect. A ‘very short’ illness could be anything: Appendicitis, for example. On the surface, ‘very short illness’ sounded innocent enough, so why not give the reader that detail? Note the time of death. Emmett died right after midnight, meaning the editor and the layout team likely had to stop the press, strip the first page of the newspaper and create a new layout at the last minute to make the first edition. Note these nitpicky details. The article announcing Emmett’s death was placed just slightly over the fold, indicating this was a prominent person, even though Emmett’s congressional career was not distinguished. Anyone of less importance would have had a death announcement on another page, or the editor may have held the news for the next day. Also: Whoever wrote the bare bones obituary had only the basic details about Emmett’s death at Pensacola Hospital. He or she wasn’t able to confirm anything else about Emmett or funeral plans in the middle of the night, and the details about Emmett’s life came directly from his congressional biography — obviously, the writer didn’t contact or interview local family members or friends to round out this last minute addition to the paper. Finally, note the typos, which indicate that this death notice was very last minute. The other articles around Emmett’s death notice appear well edited. This is what reinforces my belief the editor stopped the presses for the May 29, 1918 paper for this last minute addition. From the May 30, 1918 issue of The Pensacola Journal, page two. I think it is interesting to see the placement of Emmett’s funeral story the following day; I also wonder why (if he was so important to have three articles about his death in the paper) this item is moved off the front page. There was a lot of good background information to unpack (which I did in earlier posts, here and here). As I reflected on this article, what stood out to me was mention of the surprise and shock of Emmett’s sudden death, and that few knew he was ill. But, at the same time, why no mention of the illness that brought about the surprise demise? Since Emmett’s death was a surprise, that WAS news — so why not tell the reader the reason BEHIND Emmett’s death –unless the reason was embarrassing to the family and friends who knew him best? Rheumatism. Really? Source: Ocala Banner, Dec 22, 1914. Another interesting item: Emmett was buried from the home of what appeared to be (at the time) a political frenemy — J. Walter Kehoe, and not from Emmett’s own home, or his brother Frank’s home in Pensacola. As I was collecting any and all information about Emmett and his pals in those early days into Emmett’s research, I’d discovered that Kehoe had long coveted the office of U.S. Congressman. In fact, it was reported from Kehoe’s speeches and other news coverage that he considered the office his dream job. (The Florida Democratic party leadership didn’t agree; they liked him fine, but they always considered Kehoe as the runner-up to someone else whenever it came time to select the candidate for the office.) Emmett and Kehoe had an unusual relationship, and this was going to definitely be an interesting part of Emmett’s story to unwind. The Pensacola Journal, May 31, 1918. This was the post I wrote about this item a while back; also, this post included details pertaining to Emmett’s funeral, including the info featuring Emmett’s mortician (who sported a creepy mustache to boot). The shorter third article ran on the third page, although in a good layout position (right hand page, under the number). The details are a bit general — which makes it hard to tell if the writer was actually present at the funeral. The subject is that a lot of people attended Emmett’s funeral. I mean, look at the ‘article,’ folks. It is only three sentences long. I’m curious about the Rev. Johnson, who gave a ‘touching tribute’ memorializing Emmett — I wonder who actually briefed Johnson about Emmett’s life, because although he was an Episcopalian, Emmett was not a regular churchgoer, and probably had few conversations with Johnson. All this information was great, but it left me with many more questions than answers — and critically — I still didn’t know how Emmett died. I knew I’d have to work backwards with this information in order to tell Emmett’s story — but I would need more details about himself, and his family. I reasoned that if this guy was important enough to garner three articles just about his death, there was more to this story. The hard work was just getting started — I knew I’d have a long slog ahead to uncover Emmett’s story. But I didn’t care. I was on a mission. I was possessed by Emmettism! On April 27, 2013, I called the West Florida Genealogical Society in Pensacola, and spoke with researcher Peg Vignolo. I introduced myself, and explained what I was looking for. “Nope,” she told me after checking several resources. “We don’t have anything on Emmett Wilson other than what I’d already found about him myself on the Internet,” which isn’t a whole lot, she added. I agreed. Peg said it was curious that there was such little information, given that he was the youngest U.S. 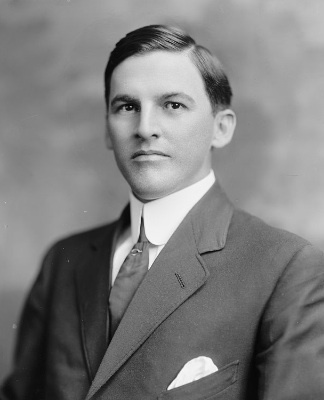 Congressman at the time, and the first from Pensacola after the new congressional district was formed in 1908. I mentioned the date of his death, and asked for a copy of his obituary, if they had copies of The Pensacola Journal from 1918, since the 1918 edition of the paper didn’t seem to be on microfilm yet, or available via ChroniclingAmerica.gov, the online newspaper repository at the Library of Congress. Peg said that they had the bound issues of The Pensacola Journal for May 1918, and would be happy to make copies and email the obituary to me. “May 1918, huh…,” she added thoughtfully. “Maybe it was the flu. The pandemic hit West Florida pretty hard in 1918. It devastated many families here in Pensacola.” I told her I wasn’t sure, but what little information I had at that moment suggested he’d died at home, so it was a possibility. Meanwhile, she’d hunt for the obituary, and refused payment. In gratitude, I emailed some of the articles I’d found already so that she could start a surname folder for Emmett. A few hours later, Peg emailed three articles to my faculty email account, one each on Emmett’s death, obituary, and funeral. She mentioned it was curious that he garnered not one but three articles in the local newspaper, something unusual about a person of suggested prominence but lacking a file in their historical archives. Definitely unusual — and mysterious.